When the top cop is a liar and guilty of crime how can the public trust anyone working under them. 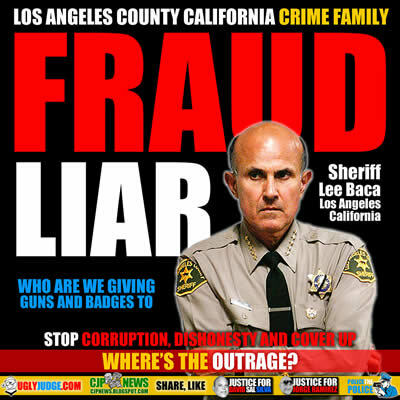 Sheriff Lee Baca resigned to keep his lucrative pension and salary a common scam among government when they know they’ll be exposed. Los Angeles County Sheriff Lee Baca will plead guilty in a downtown courtroom Wednesday to making false statements, marking a dramatic turn in the ongoing federal investigation into corruption in the Sheriff’s Department. According to a charging document filed by federal prosecutors on Wednesday morning, Baca lied twice about his involvement in hiding an inmate from FBI agents who were investigating brutality and corruption by sheriff’s deputies in the county jails. Baca also lied when he said he was unaware that his subordinates planned to approach an FBI special agent at her home, the document said. Baca’s attorney, Michael Zweibeck, said his client has agreed to plead guilty to a single count as part of a deal with prosecutors that will see him spend no more than six months in prison and possibly no time at all. The U.S. Attorney’s office has agreed not pursue other charges against the former sheriff, and a federal judge must sign off on the deal.